This is the Epic Seven Tier List. The list is based mostly on the analysis and experiences of players in Epic Seven Discord community. Please do not take this list as absolute when playing. You can use the information from this Epic Seven tier list to set up your desired team for the best experience when playing Epic Seven. If you want to check Epic Seven tier tist – Global which provides an assessment base on each character category. Please check the resources links below. 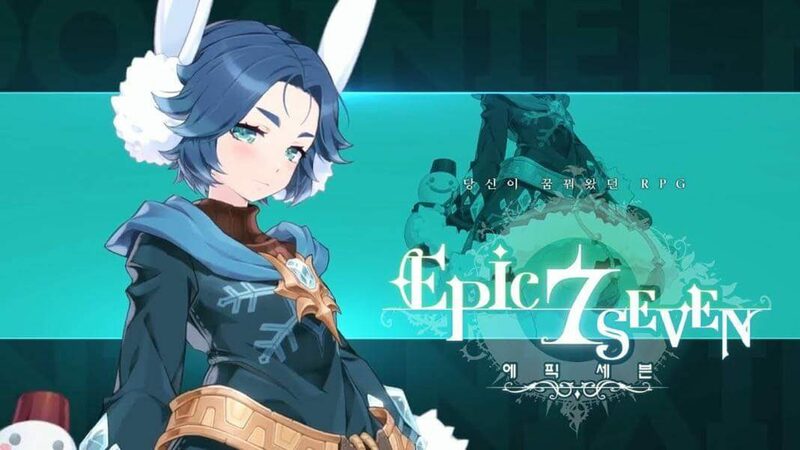 This Epic Seven tier tist will also be useful when you want to reroll for a good team in the beginning. This tier list will be constantly updating to match with the current situation of the game. Please do note that do not play with all depends on the tier list. Play with what makes you feel good. 🙂 That’s the best! 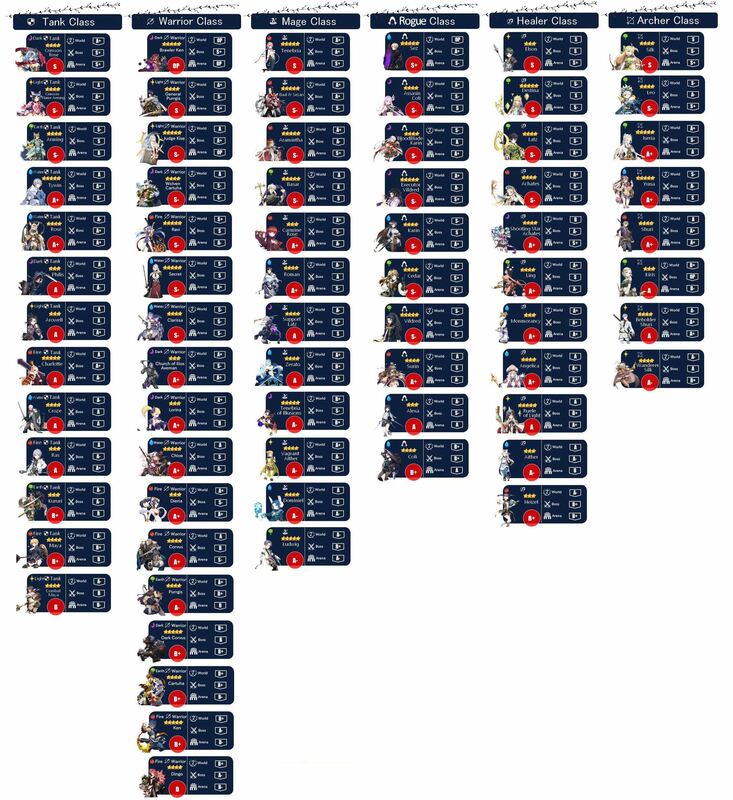 Many units who are not top-tier in this listing are still usable in most situations (and sometimes preferred). You should always prioritize who you enjoy playing. Table abbreviation: click to go. Dispel A decent budget option for defense teams. Brings immunity + buff dispel + attack down. Deals pretty much no damage, but he's meant to stall for arena lightning damage. Better options usually, but immunity is powerful. Dispel Interesting S2 passive where he cannot take above 35% of max HP (mola'd). Beyond that he can dispel on S1 and that's it. Slightly below average warrior stats make for an unexciting prospect. Tank Provides immense tempo control with AoE Provoke and AoE Atk Down. Also applies some offense pressure since the same abilities deal AoE damage. Requires significant molagora investment for her S2 and S3. AoE DPS A knight with warrior stats, she works best on offense when she can Soul Burn S3. Achieves momentum with Elbris Ritual Sword procs and CR Boosting from S2 stuns. Immunity Full team invicibility provider + 3 turn immune. S2 crit damage reduction in conjunction with Aurius gives a lot of defense. Can be used to setup Ludwig in AoE cleave teams. Top tank team candidate. Support The current queen of arena. High base speed, CR boost, extra turns, 100% cannot miss def break/provoke/dispel. Absolutely jam packed kit and can carry Aurius for damage reduction or Elbris to break up AoE combos. ST DPS The best baiter against dark dps defense teams. Dark dps AI will target F Maya and allow her S2 to cleanse debuffs + keep defense buff up almost permanently. S3 scaling with defense is good enough to finish off lower hp units. Dispel Decent counterattacking tank that dispels buffs + has miss chance on S3. Can be used as a budget bait unit against dark if built tanky enough. Tank Please just specialty change her. ST DPS A defining unit in defense teams. CR reduction and AoE Def Up from S2 dramatically slows the opponent's offensive pressure. A large health pool means his S3 is usually an OHKO, and the AI is smart with using it too. Tank Tanky with a solid 112 speed. 2 stuns across S1 and S2 allow her a good chance to CC the opposing team. Def up for all allies on S3 is nice with a 50% chance to provoke/attack down fully mola'd. However, a 5 turn cooldown hurts. Buffer Strong defensive unit that has some decent def scaling. However, only manages to bring damage reduction which usually can be cut through by the top dps units. Good choice for tank defense. Support Can be used as a decent baiter with self def up. Not as tanky as other knights but still can carry Aurius to help the team. S2 dual attack gives your main dps a pseudo extra turn and hopefully that's enough to get a kill. Tank A key baton passing unit in CR push AoE cleave teams. Usually used as the 2nd CR push unit behind someone like Judith/Roozid. Provides attack up for yout combo and can help a bit to clean up the stragglers. Dispel Has best def break coverage and a huge CR swing with her S3. Her formation bonus gives dual chance as well. Ideal for most contents, but arena and raid in particular. DPS Decent stats and if you get lucky enough can push your team's CR quite a bit. S3 absorbs CR and his S1 def breaks. Mostly used in Rosa + Infinity basket setups. Tank Best suited for offense due to two-mode Turn 1 playstyle. You can opt to AoE Def Break with S3 for a Turn 1 wombo combo, or you can CR Boost + Atk Up + Crit Up with S2 to eliminate a high priority target. Dispel Great in a difficult fights with Immunity, Dispell and Attack Down.Can also be used as W11 tank. Dispel Average Fire dps with buff removal. Immunity Solid defensive tank with team Immunity and Invi. Support Great team utility, covers several roles. Top def break/dispell, part healer, part CR support, full time tank. Also is one of the fastest tanks with extra, helping to build up soul faster. 100% Taunt can cheese hard Abyss levels like 73. ST DPS A bulky DPS with high mullti based on DEF. Tank Just spec change her. ST DPS Solid defensive tank. Tank A great stunner with taunt, def buff in a long cooldown S3. Stun is quite limited in PvE except some levels in Abyss. Buffer Top PvE defender, with kinda exessive defensing capabilty in current meta. Her dmg from DEF scaling is pretty great, making stack on DEF a good choice. Support Sometime used as a dual atker, overshadowed by Kitty and Tamarinne now. Dispel Has best def break coverage and a huge CR swing with her S3. Her formation bonus gives dual chance as well. Ideal for most content, but arena and raid in particular. DPS One of the best Ice def breakers, and a good CR pusher with Unity Set. He really shines in Wyvern hunt but high Mola investment is needed. Tank He gets a hidden buff to target the highest atk. Can be a great buffer of those who want to save 50% crit chance for more ATK/critD, also an AoE def breaker and CR pusher. His S1 dispel is useful at sometime. Azalea 아젤리아 3-stars Fire D D D D D Ranon's Memorandum El's Fist Debuffer Long cooldowns, low speed, but decent hp. Debuff suite aren't as impactful as other units and when allowed to be manipulated on defense, can be very underwhelming. DPS A decent supporter with def break on S1. Brings AoE attack down, but suffers from low damage. Bulky hp and def, but not much beyond that. DPS One of the best sustained DPSers for arena. S3 lifesteal is quite relevant and can usually nullify any damage he took from an initial attack. Low CD 2 turn def break and solid AoE damage soulburned on his S2. Debuffer Landing Magic Nail and then S3 is difficult against the speed meta, making her outclassed for most Turn 1 wombo combos. Luckily she is very fast, giving her a niche a niche as a Turn 1 stun when Magic Nail isn't feasible. DPS Still a solid attacker when not specialty changed, but should complete his quest before bringing into arena. Def Breaker Essentially a budget Vildred, but on warrior class. More difficult to setup due to lower speed and arguably worse artifact selection over thief class. Commander Lorina 3-stars Dark B B B B B Uberius's Tooth Hell Cutter ST DPS Dark element allows her to be brought against any target that needs to be bursted down. Def break + S3 is usually a dead unit. Downside is she is quite fragile and can be easily targeted on defense. Tank Bulky fighter that has good effects on his skills. However, long cooldowns and low damage means after his initial turns can largely go ignored. Debuffer A support fighter with lots of DoT's and debuff removal. Well rounded package for PvE, but lacks impact in PvP. Def Breaker Self-sufficient attacker with attack and crit buff built into his S3. S2 is very unique with def break + cannot buff. However, it won't dispel buffs so try to use on a clean target. Long cooldowns hold him back from any serious use. Tank Nightmare for AoE cleave as he will push the CR of his team before the full combo can be setup. Outside of his S3 and S2, he is very underwhelming. Build for tankier stats +eff, not damage. Buffer AoE cleave team unit that is sometimes used in place of Rose. Helga only provides attack up, but strong base speed of 114 + a speed imprint means an easier time securing the 1st turn for your Judith/Roozid. Inflicts up to 3 Turn Skill Delay on her first turn, making it imperative to build her with as much speed as possible. Compass is recommended if Effectiveness is low (~35%). Strak Gauntlet artifact can be used if her damage isn't required. Tank Has great utility with Turn 1 stun + Def Break. A multitude of debuffs means that even though he has a slow start, he's still useful while building to 100 Fighting Spirit. Cleanse With a good base speed(112), she can use S3 early to get team cleanse, self immunity and 3 turn dual-atk, which means if you pair her with strong S1er like Luna, the dealer is almost getting 3 free turns. Lorina 로리나 3-stars Dark D D D D D Uberius's Tooth El's Fist ST DPS Can still be brought to arena due to the power of her S3. Seek to specialty change her. Def Breaker Extremely high damage Turn 1 nuke on her S3 that attacks with an advantageous element and inflicts Def Break. Pair well with Iseria. Ususally having a good speed and passive can also help with surviving uner 50% HP. Tank 100% counter when crit + lifesteal usually means he can't be killed unless 1 shot. Add in great damage scaling and AoE def break, he's a defining unit in the game both on offense and defense. Self-Buff Speedy def breaker that needs some turns to ramp up from built in Ranon's on S2. Pushes his own CR on S1 to take lots of turns, but a base attack of 1000 and low S1 multiplier means it'll be tough to do damage. Speed imprint though. Tank Counter-attack machine. What he does, he does really well. Only problem is he doesn't do anything aside from conditional AoE damage. Tank Durable vamp bruiser that deals great damage with her S1. Hard counters earth units due to her innate tankiness, CR boosting on hit, and lifesteal on S1. Debuffer Works best when moving after all her teammates. Her S2 -> S1 proc will one shot squishy targets but having her team hit first helps ensure they get into execute range. Try to pair with AoE damage CR Push like Shadow Rose and Schuri. Dispel Crit damage reflection + provoke + dispel + high base hp makes for a good kit. Was used in Korea briefly in high end arena teams. Could make his way around again given the prevalence of AoE cleave + buff heavy teams. Debuffer The previous queen of Arena brought back to the mortal realm from nerfs. Pushes CR, but low base speed and the loss of def break on S3 means she is just average. Upside is a speed imprint that you'll eventually SSS. Dispel Def break and target is buffed = dead with S3. Setting that up is a little more difficult with the most popular def break (Fl Kluri) dispelling buffs as well. Solid sustained dps choice that can burst under the right conditions + dispels buffs. DPS/Tank A general bruiser with def break, can tank well with gurantee Evasion on self and give a team-wide 15% Evasion buff. Has decent dps. Azalea 아젤리아 3-stars Fire C D D D C Ranon's Memorandum Debuffer Has high proc rate debuffs (speed debuff, heal ban, taunt) and has max hp based self heal on 1s. Budget heal ban choice. DPS A decent supporter with def break on S1, his merit is that he can easily have high (45+) morale team. DPS Tanky def breaker with great aoe and dps. Debuffer One of convenient dps choices in Wyvern hunt, great against any boss with a fast attacker (flat 2% HP per attack under Magic Nail), her S3 multi is also super high (~700%) with Magic Nail and SB. Commander Lorina 3-stars Dark A+ A S S S Uberius's Tooth Hell Cutter ST DPS Top general damage dealer. She has a passive modifier of 1.75, making her S1 300%+ per hit, as high as many chars' S3. Her burst may be bit lacking among tops. Great morale ability (easily 40+) makes her a top choice for Raid. Tank Another tanky fighter, but provides support more than damage. Scales with defense, but takes a while to get warmed up. Tank Mainly used in PvP due to his fantastic S3. Wyvern 11 enables him to be a great CR pusher (30% CR per wyvern turn) too. Buffer She's a budget atk buffer alternative besides Hazel for those have no Diene, also with def break on her S1. More of a PvP unit, Skill Delay is a useful at many bosses and AoE damage is desirable. Tank After the rework, 100% Def Break (ignore res) on S2 + 35% Def Break on S1 make him top Def Breaker. Vigor gives him extra 30% so his dmg is desirable. 100% Atk Decrease + high base HP (7323) are also a bonus. Cleanse Has a pretty good 3-turn CD heal ban to shine in Golem, beside that she's a dual-atker with 3/5 coverage. If you can pair her with strong S1er such as Ravi it would be profiable as almost 1.6X dmg . Def Breaker She's a Lorina level all-round dpser with avg 1.4 multi on s1 and 1.3 on passive. Top Wyvern killer, easily 3man w10/11. Her gearing is convenient with 30% crit rate up. Speed is welcomed, def break coverage at roughly 2 of 4.3 turns. Self-Buff With investment, Mucacha can be an option for a DEF Breaker (speed/hit) or DPS (speed/crit) while bringing a +8 Speed buff to your party at SSS. Tank With her 1.6X passive modifier, she's Lorina level dmg dealer who can vamp-tank well. She can be a solid threat in all modes and doesn't need high investment (S1+4 is fine). You'd like to always turn off her S3 to keep 1.6X buff. Buffer THE NERF hurt him so much, no continous healing and cooldown+1 make him barely worthy for a position in good team, while things left are S1 35% def break, S2 Speed Up and a long CD S3 for AoE Dispell. Debuffer Solid Ice dps based on debuffs. Dispel Ice tank with dmg reflection, can be used in W11 if you don't have other choices. Debuffer THE NERF destroyed her mostly, can be used as a OK level CR pusher with meh speed and HP % dmg, but rarely chosen with better choices being there. Adlay 아들라이 3-stars Earth D D D D D Abyssal Crown Kal'adra Support 75% chance (mola'd) to increase enemy CDs by 1 on S3 is powerful. S2 pushes his own CR often and a stun on S1 makes for a decent PvP kit. Held back by average multipliers on skills and average attack stat. Buffer Low speed and initial damage make her outclassed for Turn 1 wins. The AoE Atk Up and high consistent damage from Burn make her shine on teams that commit to a slower pace, or when you are faced against tanky defense. Buffer AoE silence and a 80% CR boost with attack up can bring even the slowest DPS to 100%. Great unit to setup a combo with on offense, however difficult to manage his S2 on defense. AoE DPS Extremely disruptive unit that wins by applying AoE Spd Break, AoE Def Break, and Unhealable on S3, and then winning on Turn 2. Best when used with someone who can lock down enemy cleanses or on cleave teams. Self-Buff High multipliers on her S3 and S2 allow her to be a pretty strong single target threat. Def break and a sorely needed self speed up are nice. Very fragile with one of the lowest base HPs in the game, but has relatively high def to compensate. Debuffer Burn focused mage, but only 1039 base attack means they wont tick as hard. Very low base hp means her S2 will likely only proc once before she dies. Underwhelming kit and stats. Celestial Mercedes 외우주의 메르세데스 4-stars Dark A B A B B Tagehel's Ancient Book Kal'adra AoE DPS S2 scales dmg with enemy hp, S3 is a strong aoe that gives her readiness as well as a two turn attk buff. These together make her strong in cleave compositions. CR Pusher Usually a core unit in AoE cleave teams. Can be built slow to get pulled to the front via AoE crits. Shines much more on offense since her SB'd S1 deals massively more dmg. Crit buff allows for just 50% crit chance and the rest in critD/ATK. Debuffer AoE stun and CR manipulation are nice but come with low chances. Damage reflection is a bit gimmicky and suffers in a meta where buff dispelling is very common. Low base defense, but OK speed. Support Needs debuffs to shine, so if you know the defending team will debuff her, she's a good choice. Defense wise, she can go largely ignored. Healer Fragile mage that brings high damage and healing from S3. Setup a def break + S3 = full heal for your team. S2 scaling from attack is high and can provide a barrier for around half of HP. If he can live, provides great dmg + sustain. Hurado 휴라두 3-stars Dark B A B A A Sira-Ren Iela Violin Support Cuts healing and his S2 can break up buff setups due to self CR push. S3 dispelling buffs is his main use and is pretty strong to counter Diene + Carmin + Maid Chloe + other units that rely on key buffs to operate. Jena 제나 3-stars Ice D D D D D Sira-Ren Tagehel's Ancient Book Debuffer If you need a blue AoE mage to carry Sira-Ren, Jena could be a consideration. Hit down, attack down, and speed down are good for stopping damage, but the rest of your team better have a good use for that as she doesn't do much else. DPS A good offense AoE cleave team damage dealer. Needs invicibility setup (usually from C Armin) to shine, but can usually clear an entire team due to 50% defense penetration. Mercedes 메르세데스 4-stars Fire D D D D D Sira-Ren AoE DPS Ok AoE, but on long cooldowns and multipliers are not the best. As far as free units go, Serila would be a better choice overall. Support Has a decent attack stat and brings light sustain to your team. Unhealable + attack down are good debuffs, but her S3 revive is difficult to get off successfully and requires you to kill someone (i.e. you're probably already winning). Support Her S3 is actually quite powerful with AoE cannot buff + CR reduction. 110 base speed means it's possible for her to go 1st and get her S3 off. Pearlhorizon 펄호라이즌 3-stars Earth D D D D D Tagehel's Ancient Book Debuffer An average damage dealer with some AoE and several debuffs. Her S3 has a 100% chance stun for 1 turn, which also does 20% max HP damage to one sleeping target. 112 base speed is nice and can fit a niche for some teams. Dispel AoE buff dispel is his primary purpose. Preps the enemy team for your team to execute the combo. Need to be mindful about the turn order and elemental disadvantage vs. green units. Debuffer Brings great single target damage, but on bit long cooldowns. High def, low hp, lowish speed leaves much to be desired. Debuffer High S3 damage, but needs setup to work. Poision is much more underwhelming than bleeds and burns in PvP. Overall not a great choice when there are other units that can 1 shot with S3 and bring more utility/survivability. AoE DPS Works best when speedcreeping friendly units to apply AoE Def Break first, allowing her team to inflict heavy damage. Self Atk Up from S3 combined with more AoE from her S2 let her clean up Turn 2. Can be built for more damage. DPS Most PvP teams have several skills that will activate his S2 passive, making him useable on defensive stall teams that also appreciate the tempo control from his S3 AoE silence. Debuffer 75% chance to AoE stun for 1 turn when mola'd is great, but low speed and low hp means it can be tough to get off. If allowed to roam freely, he can deal solid damage. Self-Buff Great utility kit + 1.5 multi S2/S3, with CR Decrese, Speed Down and Dispell, also three self-buffs(atk, def, speed) and lifesteal on S1. Used to be a decent all rounder but HP/DEF limits her now. Celestial Mercedes 외우주의 메르세데스 4-stars Dark B C C B B Etica's Scepter Kal'adra AoE DPS S2 scales dmg with enemy hp makes her viable in hunts, s3 is a strong aoe that gives her readiness as well as a two turn attk buff, easily farmed formation bonus as well for party c.chance. CR Pusher Best burst dmg in the game, can skip Hell bosses' phases easily. Mostly due to her S1 SB multi and S2, but also because her crit chance boost enables crit damage necklace, and no need for speed boot. Notice that S2 skillup has a low income. Mercedes 메르세데스 4-stars Fire D D D D D Sira-Ren AoE DPS A starter unit with meh multi, not recommended. Support Wyvern Killer - AoE heal for the team while also doing competent single target damage. Her debuffs are ideal against bosses. Notice that she needs heavy Mola investments and is fragile. Support Reduces AoE damage you take + heal ban + buff ban. A specific char made for Golem. Pearlhorizon 펄호라이즌 3-stars Earth D D D D D Sira-Ren Debuffer An average damage dealer with some AoE and several debuffs. Her S3 has a 100% chance stun for 1 turn, which also does 20% max HP damage to one sleeping target, but since most bosses don't sleep would be difficult to execute. Dispel Mostly used in PvP for dispelling. Debuffer Skills with nice multi and spamable s2 that heals herself. Debuffer She's one of the fastest Golem 10/11 killer after invested, both in auto and manual, via high speed, spamming poison and being top multi. Debuffer Budget attacker that when built with 100% crit can take out most def broken targets. Ok speed for an attacker, but low hp and defense stats means she better kill their dps on her turn. Debuffer Weaker top end dmg output than regular Vildred, but a revive on S2 and no type disadvantage means he can work better on a defense team. Can be tough to get off S3 twice even with a revive, but if he does it is usually a win. Debuffer Second highest speed in the game and has a fantastic S3 to shutdown a target. Only problem is he has difficulty following it up if his S3 doesn't secure a kill. Assassin Coli 암살자 콜리 4-stars Dark A A A A A Dust Devil Rhianna & Luciella ST DPS Has one of the highest base speeds in the game and a great multiplier on S3. Easily can secure the 1st turn and stun a valuable target while remaining in stealth for most of the match. Blood Blade Karin 혈검 카린 4-stars Dark B B B B B Wind Rider Dust Devil DPS High base hp and can deal a ton of damage when on low hp. What she lacks in debuffs she makes up for in damage and sustain. Def Breaker Speedy high single target damage dealer that can self buff speed and def break. S3 with attack up on a def broken target can 1 shot even the most tanky targets. Speed imprint as well. Coli 콜리 4-stars Ice C C C C C Rhianna & Luciella Dust Devil ST DPS Thief focused on shutting down 1 unit through stuns and CR reduction. Perma-stealth gives her a lot of survivability, but 111 base speed means a much harder time to secure the 1st turn compared to her ML counterpart. DPS Works best on AoE cleave teams. Low HP and Def base usually means he dies when an ice unit sneezes. Has remarkably low Atk for a thief, so requires significant molagora/gear investment to do damage. Debuffer One of the top CR pushers in arena. 117 base speed means she is usually the 1st to pass the baton to a 2nd CR pusher. Stun on S1 can help clean up stragglers, but she isn't for damage. Def Breaker A 1 unit nuker that brings her own defense break. S2 into S3 is a kill on most dps and with gear can threaten tanky targets. Sadly, Diene is the current meta and can shut down her turn chaining from S2 to S3. R&L not necessary in PvP. Self-Buff Counters AoE cleave teams as they usually can't get rid of Kayron's immortality. Dust devil is essential to getting off more attacks while preserving his buff timers. Skill Delay S3 will OHKO almost anything suffering from Def Break. It can also be used to dismantle codependent teams by inflicting a 2 Turn Skill Delay on a single target. The stealth is fantastic and helps offset her fragility. Debuffer 120 base speed is high and can usually secure the 1st turn. 2 turn silence on S3 is nice, low hp, and low defense means she's likely dead after 1 S3. Having a good multi with S3. Debuffer Support thief, great for AoE push teams but can be used as a general CR booster. S3 on 3 turn turn CD with R&L procs can be ridiculous. Speed down and attack down can help neuter attackers. Also speed imprint as a bonus. Debuffer Boosts CR and has speed imprint. That alone is worth something. Seek to specialty change him if you want to use him, since added base speed is very strong on top of all his smaller goodies. Debuffer Works best when moving after all his teammates. Moving last allows him to pick off a low HP target with his S3. The AoE damage from S3 receives the damage boost from Wind Rider, and when paired with ATK up, can hit for over 10k AoE. Specimen Sez 5-stars Light B C A C B Rhianna & Luciella DPS Does 2.6X dmg as Watcher Schuri, making him great nuker for HP built defenders. Good partners include AoE stunners like General Purgiss, Leo, Corvus, and Charlotte. ST stunners like Yufine, Assassin Coli, and Assassin Cartuja can work too. Debuffer Debuff stacker that needs multiple turns to put together strong damage. Could be useful vs some defensive teams given time to work, but not a high priority. Self-Buff Poor scaling unless he is on low health. 1 turn immortality with no personal way to extend it means he will need help from a healer or buff extender. Can be used as a counter vs certain AoE cleave teams. Self-Buff Widely used AoE cleave comp dps. CR boosts + def break/attack up + S3 into S2 can bring down even very tanky teams. However, even just 1 red unit can spell doom as Vildred will be paper from stacking offensive stats. Tank High base hp but low base defense. Very vulnerable before he gets his S2 off. Should be built with a lot of HP (15k+) to survive until then. With S2 on cooldown and Moonlight Dreamblade, he becomes a monster. Debuffer 100% crit chance is needed. Her S1 has two ticks at 1.0 and 0.75, which can trigger Joker twice, making her top Wyvern 11 dpser. Her poison is also a bonus, but low base HP/DEF limits her usage elsewhere. Debuffer Mostly a PvP unit, can be used as a farmer. Debuffer Mostly used in PvP as a top speed CC, the poison proc and S3 dmg can be decent. DPS Top utility dpser with high multi, reliable healing and best heal prohibiting. He can make Golem 10 and Wyvern 10 much easier. Also very helpful in any boss that needs to hinder the healing. Debuffer Mostly used in PvP as opener. Def Breaker Loses 1 rating when missing essential artifact. 100% crit chance is needed. Great single target damage dealer who can chain several turns together and def break. Top Wyvern killer. Self-Buff Immunity set can turn his S1 into AOE and refresh at every wave. Skill Delay Her skill delay is incredibly useful in all modes since it can be used against bosses. Juicy S1 against Wyvern's shield and great S3 multi for burst. Debuffer Great burst damage, good farmer and decent at Wyvern. Specimen Sez 5-stars Light D D D D D Rhianna & Luciella DPS PvP unit. Debuffer She can easily stack 7+ levels of Bleed, a pretty good choice for Wyvern 10 and some bosses weak to debuff. Self-Buff Top farmer and top Banshee killer . Tank Undisputable best frontliner for Banshee and menace against Ice units in PvP. Safe, albeit somewhat slow farming unit as well. Works best when manual since AI will use S3 without full focus, dramatically reducing its usefulness. Tank Decent healer with good healing and debuff cleanse on S3. Invicibility on S2 can be relevant sometimes even if the healing is low. Downside is that immunity tends to be better than cleansing meaning your team is vulnerable after S3 is used. Aither 아이테르 3-stars Ice D D D D D Rod of Amaryllis Wondrous Potion Vial Healer The baseline healer. If you have no healer to turn to, then time to call up Aither. Mixed attack and HP scaling usually means he is very squishy. Coupled with 4248 base hp, he is tough to keep alive. Tank Great healer that brings immunity on defense. Forces opponent to bring buff dispel or will have a hard time killing anything. Sadly, that is easy given the prevalence of F Kluri. Cleanse While she doesn't have revive, S3 is usually a full reset for your team + CR boost as well. Relatively high base hp + Water's Origin means she can survive an initial onslaught. Healer Diene brings near-permanent uptime on Atk Up and Crit Def Up, and a fast aoe cleanse + barrier. Wonderous Potion Vial is essential to help combat speedcreeping Turn 1 CC like Falconer Kluri's Provoke and Assassin Coli's stun. Buffer Def up and CR push is good, but one of the slowest units in the game. Part of her healing is HoT based and her CDs are not the best. Useful for a placeholder in a defense team until you find something better. Healer Has attack up and def up on 1 skill. Past that he doesn't bring much to the table. Healing from S2 is weak and S1 attack down is ok, but nothing to write home about. Healer 10 less base speed than Mascot Hazel makes linking attack up for your dps much harder. No real reason to run her in arena before you specialty change. Buffer Built in Vial on S2 is solid. Only has a HoT for healing, but provides a nice speed buff for the team. One of the fastest soulweavers, but underwhelming otherwise. CR Pusher Decent CR pushing healer. Lacks a way to deal with debuffs so must rely on Vial. Heals are also HoT based which can be a downside for PvP. Buffer Her S3 gives an AoE Atk Up and Auto-Revive buff for 3 turns, allowing her team to achieve momentum at the start of battle. Struggles against units that can easily purge her Auto-Revive, like Falconer Kluri and Iseria. Healer 101 base speed is high for a soulweaver and has the unique Greater Attack buff. Healing isn't that strong, but if can be utilized to take out 1 target early, can have a spot on your team. Healer Provides immunity on a short CD and can get pretty quick with Tome +S3 CR push. Debuff dipsel is nice and a rare sleep albeit low % chance on S1. Support Decent CR pull unit with def break. Needs another CR booster if used for combo, but solid in a non-combo team as well. Light lifesteal can offset arena attacker damage a bit. Very fragile so only use when she wont get targeted. Buffer More of a buffer rather than a healer. The RNG from the 3 buffs can sometimes lead to big wins or be fairly useless. Does also bring def break to the table and the elusive crit damage buff. Tank Her S3 is a single target revive + full heal and ST invincible, making her shine on defense. Incredibly tanky, she's difficult to kill and works best when paired with tanks or another reviver, like Maid Chloe or Shooting Star Achates. Shooting Star Achates 슈팅스타 아가테스 4-stars Dark B A+ B A+ A Wondrous Potion Vial Magaraha's Tome Healer Revive healer that brings the target back low but with immortality. More susceptible to dispel, but her healing circumvents cannot be healed and usually heals for full hp. Buffer Gain +3.5 Rating when paired with Iseria at Offense. You can get reliable healing, Atk Buff and 50% CR push on S2, Dispell and Dual Atk on S1, as well as cleanse after skill reset. The aoe dispell is great against Tank teams and a meta changer. Tank Top cleanser. With a 3 turn cd and candle, she can cast cleansing with high frequency. Great Morale capability for Normal Raid. Aither 아이테르 3-stars Ice D B D C C Rod of Amaryllis Wondrous Potion Vial Healer Decent Ice healer. Tank Top benefiter of Meta, argubly best healer in PvE. With her 100% coverage Immunity and reliable healing, she makes Abyss, Raid and Wyvern 11 much easier. Cleanse More of a Tank/Healer than a Cleanser due to long S3 CD. Solid healer with great S1/SB healing. speed would be appreciated, counter set is also an option. Can tank effectively due to high base HP/DEF. Healer Top buffer in game. Besides ATK buff/crit resist, she also has fast aoe cleanse/strong barrier. Soul spammer and decent healing with Rod. She has better Morale than Tama but lacks burst dmg and solid healing in comparison. Buffer She is top tier for abyss and hunt because of her Def buff + sustain on S2, and massive 1target heal on S3. However her abysmal base speed (86 which is the slowest of all units in game) makes speed set and boot almost a must for her. Healer THE NERF hurts, can be used as a budget atk/def buffer and decent in some levels that not requiring buff coverage so much. Healer Just spec change her. Buffer Wonderous Potion vial for passive, high speed in healer and a HoT on her S3, really shines in Banshee 11. Healer She's the ideal Golem 11 supporter/tank and provides great support to Fire heroes. Healer Budget Immunity provider and decent healer. Support Gives teamwide lifesteal and CR, while employing various debuffs esp Def Break. Note: No matter what sets you give her, she needs tanky substats/mainstats since she is very squishy. Tank Mostly used as a best PvP defender, her single target heal and revive is pretty viable at certain situation like Wyvern 11. Buffer After the great buff, she's a Diene level supporter, with better burst/healing and atk buff coverage (4/5), as well as top CR boosting capability. She can also be used at the same time with Diene to be a dual atk machine. Tome for faster cycling. Def Breaker High base speed and AoE def break means she is a great candidate for AoE cleave teams. Pairs well with C Dom given she can go S3->S2->S1 triggering S3 meaning a possible 13 crits in a row to pull C Dom. Celeste 셀레스트 3-stars Light A B A B A Otherworldly Machinery Exorcist's Tonfa AoE DPS Top speed in the game. S2 is used to push back CR and try to secure the 1st turn. If untouched can constantly pushback slower enemy teams due to her high speed. ST DPS One of the best utility attackers. She has considerable dmg, buff dispel, 2 def breaks, rare 'unable to buff', and rarest cd reset ability. Much tougher to use on defense as S3 can be baited + targeting for S2 is difficult. ST DPS Poison stacking in PvP is not nearly as good in PvE. Support Low attack stat and scaling meant for PvE high hp targets. Does cleanse 1 debuff, but on a 4 turn CD (mola'd). Outside of that, she doesn't do much. Not hard to find a better alternative if you want a cleanse. Debuffer 117 base speed and -3 turn CD on her S3 can be used for some specific attacker setups. Doesn't bring any damage herself but sleep on S2 is strong CC. DPS Great CR pusher and has speed imprint as well. Needs 100% crit chance to function well and speed to be high in the turn order. Weak to Diene S3, so have a way to deal with it or run AoE cleave so that she doesn't get it off. Debuffer High base speed and AoE speed down + team speed up can be a strong opener. However, has fallen out of the meta in favor of CR pushers. Wanda 완다 3-stars Dark C D C D C Rosa Hargana Infinity Basket Debuffer 109 speed with a high damage nuke that stuns for 2 turns. Applies target debuff each turn to a random character for your team to nuke down. But randomness of her target debuff holds her back. Debuffer Powerful S3 that essentially shuts down 1 character. Does best when going 1st, but with 112 that can be bit difficult. Additionally many other characters can simply outright kill a unit at 108 base speed + their S3. Watcher Schuri 주시자 슈리 4-stars Light S+ A S+ S S Exorcist's Tonfa ST DPS A top attacker to one-shot anyone. Pairs well with characters who can boost crit chance, such as Tywin, to save more stats for the 141% def penetrating shot, also Iseria to reset his S3 cooldown. AoE DPS Best when paired with units who scale with speed and want to Turn 1 nuke, like Cidd and Vildred, since her S2 provides AoE Atk Up + AoE Spd Up. Her S1 and S3 help clean up low hp targets and can cripple stealth-reliant units. Def Breaker Crit dmg and speed give her high HP% dmg, and great def break coverage. She is also a top Banshee killer and farmer (5 aoe in 7 turns, 3 with def break). Can cheese most Abyss levels, even off element, while Bloodstone can heal to full HP. Celeste 셀레스트 3-stars Light C D D C C Otherworldly Machinery Exorcist's Tonfa AoE DPS 128 speed, easy spammale AoE attacks. Also a decent farmer if invested heavily. Otherworldy Machinery is only available in KR. ST DPS One of the best utility attackers. She has considerable dmg, dispelling buff, top def break coverage, rare 'unable to buff', and rarest cd reset ability. She can fit in most squads and the skillset can make Abyss and Raid easier. ST DPS One of the most chosen characters for Abyss, can cheese many of hard Abyss levels incl.80-90. A great Golem killer in early game. Debuffer 124 speed and strong CR delay can cheese Golem or any other bosses that isn't immune to it, if you have the slot to put her in. Would be much more useful when harder bosses come out. Support Can be used for her HP% dmg and cleanse. Debuffer Rima is actually pretty strong if invested heavily and manual, her self cd reduction on S1, 117 base spd and dual-atk can make her skill spammable. High freq -3 cd on s3 is also great, kinda like a mini Iseria. DPS Top CR pusher in current meta, his kit can give around 40% acceleration per turn with a maxed Rosa. Also has decent dps. 100% crit chance is needed and top speed is appreciated. Wanda 완다 3-stars Dark B D D D D Rosa Hargana Infinity Basket Debuffer Can be used at Wyvern 10 as a stable debuff provider and dual atker. Debuffer One of the best Joker spammers, works well against high HP bosses with her CR delay and debuffs. AoE DPS Gains .5 - 1 rating when paired with C. Dominiel. She deals AoE on every attack and has useful Attack/Speed buff, could be used in Hunt and as a farmer, but overshadowd by many other choices due to coverage/dmg multi.